With a strong focus on self-defense, Alliance’s fundamental class incorporates the same jiu jitsu first taught at the original Gracie academy in Rio de Janeiro, Brazil during the 1960’s. The class is designed to prepare students for both self-defense, and sport jiu jitsu while at the same time improving cardiovascular endurance, balance, and coordination. The fundamental program is designed for anyone, male or female, of any body type, or age (18 and over). The class quickly prepares students for Alliance’s world renown advanced class, and gives students a sturdy base of knowledge that they will put to practice throughout their jiu jitsu study. Class format consists of the following; a light warm-up, 2-3 techniques are shown, and finally several drills are performed. The drills are Alliance’s secret to successful teaching, and are equivalent to sparing for beginners, but are done with little resistance to reinforce proper technique. There is very little, to no full-contact sparring in the fundamental class. Our founders, Romero “Jacare” Cavalcanti and Fabio Gurgel believe this is key in the evolution of beginning jiu jitsu students. Students with no grappling experience are asked to attend 40-50 fundamental classes, or 2-3 months before attending advanced classes. Our Intermediate Jiu-Jitsu class assumes that you understand a good portion of the basics taught in the Fundamentals. We emphasize on these basics while starting to introduce more complex techniques. Then after the techniques, the students will spar to build endurance, and apply the techniques to real-life situations. Students are required to have 60 classes at the discretion of the instructor to be able to join the Intermediate Jiu-Jitsu class. This is to promote a safer environment and destroy the bad habits of Jiu-Jitsu during the initial stages of learning. Our advanced class is our longest class at 1.5 hours long and it assumes that you are proficient with the fundamentals of Jiu-Jitsu. The techniques taught here complex, and we devote a large portion of this class time to sparring. Even if you are already a higher belt, the best way to elevate your game is to attend one of our Advanced Jiu-Jitsu classes. We have world class athletes that train here on a daily basis, and we have a world-renowned Grandmaster guiding us in the right path. You must have, at minimum, a Blue Belt to go to the Advanced Jiu-Jitsu class. 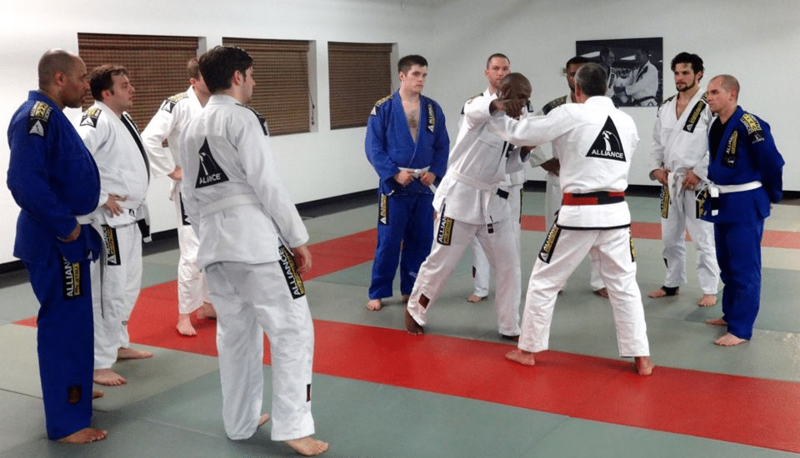 This class removes the Gi from Jiu-Jitsu and puts you in a real life grappling environment. The class focuses on modifying our normal Jiu-Jitsu techniques by reducing emphasis on the ability to grab clothing material. What you have left is a real life experience that is similar to the type of grappling done in the Octagon. We provide No-Gi classes for adults and our Little Gators. BJJ at Alliance in Atlanta puts you in an atmosphere where you can succeed with any sized opponent, gain self-esteem and confidence in your skills, and learn to never give up and raise your endurance. We will give you the skills you need to feel confident in redirection and assertiveness in any threatening situation. Our members at Alliance are taught how to assess and de-escalate situations without needing to physically use their skills. Brazilian Jiu Jitsu is a total body workout because it involves a lot of explosive throws, speed, agility, and ground grappling. At Alliance, we know the importance of a healthy mind and body. In BJJ, you’ll burn hundreds of calories in each class, develop lean muscles, and boost stamina and endurance. Brazilian Jiu Jitsu is a high-energy training class from start to finish that is fun and engaging for any student. Obesity is a serious problem in the United States, so a brand new workout to your routine will greatly help. At Alliance Jiu-Jitsu, we know the importance of a healthy mind and body, so introducing yourself to martial arts is a great way to combat obesity and promote weight loss. In BJJ, you’ll burn hundreds of calories in each class, develop lean muscles, and boost flexibility. BJJ is a high-energy training class that is great for overall health and/or weight loss. Alliance Jiu-Jitsu is dedicated to empowering you with the confidence and self-esteem needed to get yourself out of a dangerous situation. Brazilian Jiu Jitsu can bring out the positive qualities that have always been a part of you, whether that is inner calm, positive mental attitude, patience, or self-discipline. BJJ will help you overcome fear, anger and self-doubt. By empowering your body and mind with the skills to defend yourself and hold your own, all of our students are able to face their fears and walk a little taller and more confident after every class. BJJ helps build mental toughness, teaches the value of hard work, and gives you the persistence you need in everyday life. Many members at Alliance Jiu-Jitsu have said that BJJ is also a great stress-relief from school or work because it helps take their mind off problems they are facing so they can focus all their strength and thoughts into grappling on the mats. It is a workout where you have to use your intelligence to problem solve and figure out how to get out from your opponent’s hold on you. By engaging your brain during class, BJJ can help provide a completely different workout that you won’t find anywhere else. In BJJ you need to have a training partner to practice with, so you spend a lot of time with the other students in your class. By creating a bond of trust and reciprocation, you and your grappling partner can then practice various techniques on each other and see what works or doesn’t work. This martial art cannot be learned based solely on the use of paddles or punching bags. Members at Alliance Jiu-Jitsu have become close friends and help each other refine their skills and reach their goals.